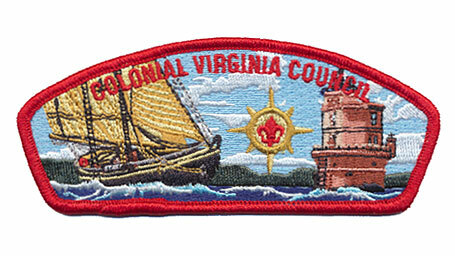 A new red-bordered council shoulder patch became available in the Colonial Virginia Council office this month. 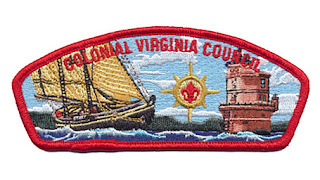 Pictured above, the patch features a sailboat on the Chesapeake Bay and a lighthouse which appears to be the Newport News Middle Light, a conical, 35-foot, red caisson light that marks the middle ground shoal in Hampton Roads at the confluence of the James River and Chesapeake Bay. Thanks to Larry Johnson for the patch photo; lighthouse information courtesy Chesapeake Bay Gateways Network. UPDATE Feb. 12, 2013 - CVC District Executive David Henion kindly provided me with more details about this patch; it pictures the Schooner Virginia and the Wolf Trap Lighthouse.